In my never-ending search for the perfect mini-laptop, the Series 9 is looking like a mighty contender to the MacBook Air. Originally, I compared the MacBook Air to the MacBook Pro and iPad 2 to find out which device held up as a better “portable” computer, but it looks like a new competitor has stepped into the ring: Samsung. From the looks of it, Samsung has a great product and by all accounts it appears to have the Air licked, but after looking closer, it might seem like you get more for your dollar with Apple. When have you ever heard anyone say that before?! Both of these lightweight computers are designed to be as thin as possible. While I still love the design features of practically all Apple hardware, the Samsung Series 9 is very close in style and material to the Air. 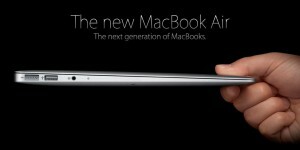 In fact, it’s even .04 inches thinner than the MacBook at its thickest point. I know .04 inches is nothing, but I’m sure there are some people out there that might raise a fuss about it! One major complaint I have about the MacBook Air is that unlike its Pro counterpart, it does not have an edge-to-edge glass screen. The silver border around the screen is actually a separate piece above the screen and this allows dust and grime to accumulate at the edges. Ironically, Apple has veered away from designs like this on every other one of their product partly for this reason. Take a look at the comparison between the two. While the Samsung has more than the Air on many points below, I still can’t see how they justify their pricing. Apple gets beat out in almost every category except for size and weight (although these two factors are not likely to be dealbreakers for most consumers). Not only does Samsung have Apple beat on everything listed above, there are also two other major differences. The first one is that the Series 9 has a backlit keyboard and the second being a 3-year warranty. On the Air, you can’t get the backlit keyboard and the only way to get 3 years of warranty service is to buy AppleCare for another $249. If we’re comparing the lowest priced 13 inch MacBook Air to the Series 9, the Series 9 has Apple beat, however you’ll be paying $350 more for it. If you bring up the MacBook Air to the same 3-yr warranty coverage, you would have only a $100 price difference with Samsung still be the more expensive device. Another thing to remember is that Apple also has two 11 inch models to consider with prices going as low as $999. My opinion is that the huge difference in price doesn’t seem to justify the small differences in features except maybe the processor and more memory. I’d say if you’re thinking about the Series 9, maybe it’s more of a comparison to the 13 inch MacBook Pro except in thickness and you might want to take a look at where you money is being spent. The last major difference is obviously the operating system. 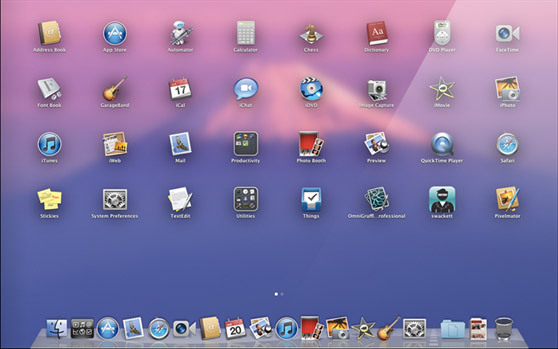 Although I love Windows 7 and how much better it is than previous versions of Windows, I still love my OSX much better! Plus, if you get the MacBook Air, you can still install Windows on it so you can have the best of both worlds. 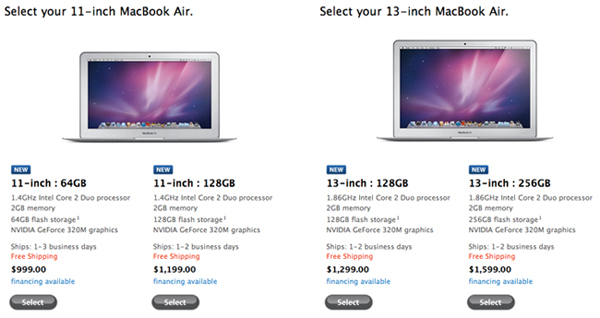 If you’re considering spending $1649 on the Series 9, you may want to consider a MacBook Pro. If you’re just looking for a mini-laptop and don’t have the heart to go all the way down to a netbook, check out the MacBook Airs. Apple may have done it again! 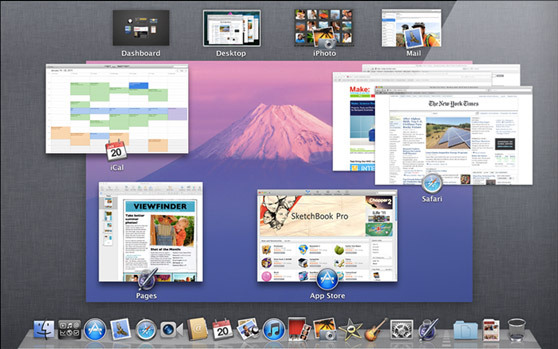 From the looks of the list below, we might have the best version of OS X yet. 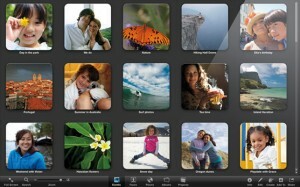 If you enjoy the functionality of your iPhone and/or iPad, you’re going to love some of the new features of OS X Lion. Take a look below and I promise you you’ll be as excited as I am. At its core, the new OS will look very similar to previous incarnations; it’s what’s under the hood that may or may not get you excited. Today, computers seem to be all about the apps and the experience partly because of the huge success of today’s smartphones. People just want things fast and readily available at all times. 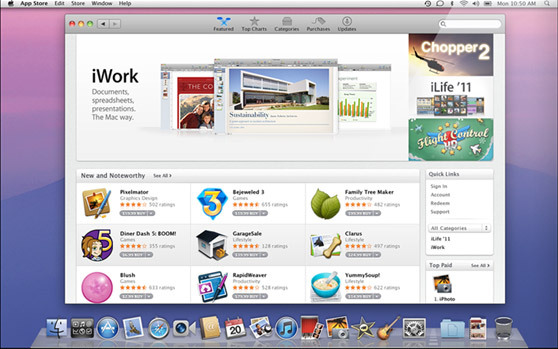 OS X Lion delivers the convenience and ease-of-use that will rival that of any computer system you can buy today. 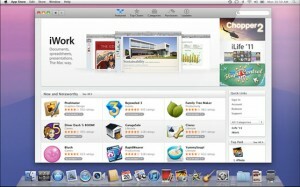 Although you can already download this app, the new App Store for Mac works just like the one for iPhone and iPad. You can now buy full software programs without having to head to the store. No more fiddling with discs or worrying that a store my be out of stock. Simply buy the app, download it and get to work. 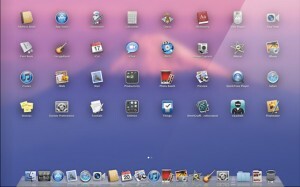 This is the one that makes your Mac look like an iPad. With one click of this app in the dock, your screen is transformed into the desktop equivalent of iPad showcasing all of your apps in one (or more) screens. I dare you to open it up and not be tempted to start swiping your screen! Take your apps to the max! 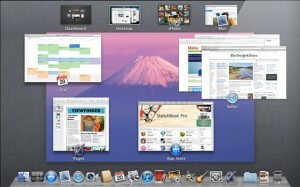 No longer will you be forced to stare at the top menu bar or the dock at the bottom. 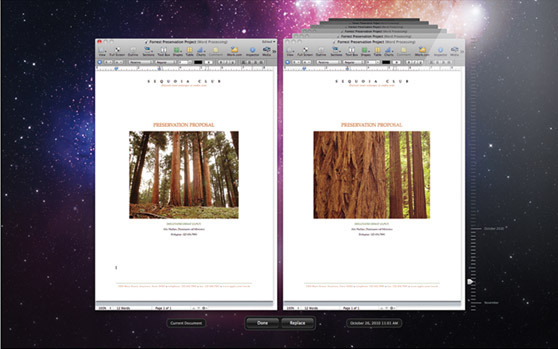 You can now open your apps to the full width of your monitor. I’m not sure if having a full screen app will make you more functional, but it’s nice to know you have the option. Personally, I like having the clock in front of me so I can see how much time I’m wasting online. Mission Control is like Dashboard, but on crack. It allows you to pull down all of your running apps right on the screen so you can see everything that’s running on your computer. From there, you can click anything you want to re-open and you’re instantly there. What’s cool about this is that all of the windows you have open are sorted by group, so if you had 4 Safari windows and two Word documents open, you’d see two groups and each of the windows showing up inside. This might be a God-send for some of you out there! I know for me, it’s going to take the headache out of creating documents. Imaging you’re pushing the battery limits on your Macbook and you’ve already completed 10 pages of your school report when all of a sudden, your battery dies! Damn. Well with Auto Save, all of your troubles are over. What’s really cool is it actually saves the current document which means it doesn’t create any copies, thus saving disk space. And if you accidentally save the wrong changes, you can always revert back to a previous version; see next feature. For those that use TimeMachine, you’ll be very familiar with this feature. It basically keeps track of every change you’ve made to a document allowing you to revert back to a previous version whenever you need to. When you open a document, OS X Lion will save a version of it and then continue to save versions every hour automatically. This is one of my favorites. Let’s say you have a bunch of windows open and you are prompted with some new updates. You’re just itching to get them installed, but then you’re greeted with a message stating that you’ll have to restart your computer. Now you have to go in and save all your documents and close everything while losing all your places online, etc, etc. Not anymore! Resume allows to restart your Mac and it comes right back on to exactly where you left off. The resume feature also works when closing and opening apps. If there’s mail program that could get me to switch from Outlook, Mail 5 just might be the one! 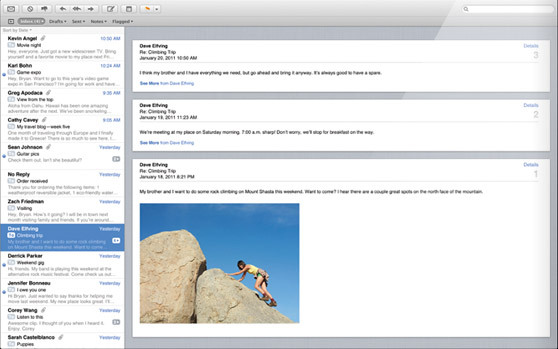 I’ve used Outlook for many years because of its vast amount of features and I was never really a fan of Mail, but the new Mail 5 offers the a conversations feature that brings up emails similar in fashion to how iPhone deals with text messages. For those of us who get our Mac friends together on the weekend so we can talk about how cool our Macs are…(silence)…we can now send and receive files just by opening an app! AirDrop will automatically locate and connect with other Mac users (locally) that also have AirDrop running so you can send files without having to pull out USB drives or burned discs. I’m super excited about this release! Given the above features and I’m sure a whole lot more that we haven’t seen yet, I know this will be the perfect mix between the functionality of a full Mac with the ease and simplicity of an iPad. I was never a big fan of the iOS software being used on anything bigger than a phone mainly because it lacks any type of file system and it makes doing some advanced work near impossible, but Apple seems to have gotten this one right. Of course, only time will tell if they did. Back in November, I discussed the comparison between the MacBook Air (2010), the iPad and the MacBook Pro in terms on functionality, performance and convenience so it’s only fitting that I now update this to include the new(er) MacBook Pro and the iPad 2. Unfortunately, the MacBook Air hasn’t seen any improvements or upgrades since the new aluminum design debuted in 2010, but it still holds up. As you can see, you still only have 2 major differences…an 11-inch screen and a 13-inch screen. After you decide what size you want, you only have two other choices to make: how big you want your hard drive to be and how much video memory you require. Just as I described the 1st iPad, the second is still just an over-sized iPhone. On the surface, there’s nothing wrong with that. However, as you might imagine, when you want to perform more specific tasks like file manipulation or writing a document, you’re going to be out of luck. The iPad is and always will be an item of convenience. It’s great to have around when you want to read the daily news, play a few games, do some email and of course web browsing, but it is no computer…not by a long shot! On my current 1st gen iPad, I really thought I was getting somewhere when I bought the wireless keyboard in addition to the USB and SD card adapters, but I was always irritated that there was no file system. I was hoping that the iPad was going to be close to ripping an LCD screen off a MacBook and turning it into a keyboard-less computer with touch capabilities. But no, you just get iOS. 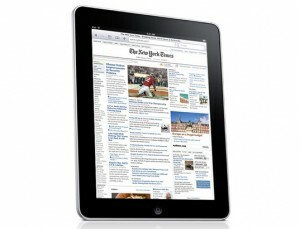 Anyway, as for the iPad 2 itself, I loved it. I don’t own one and I don’t foresee myself getting one, but I have played with a friend’s and have used it many times in the store. The thing you’ll notice first about it is how light it is. Granted, the first iPad wasn’t heavy, but you can instantly feel the difference. This is important for those of you that plan on carrying this thing around everywhere. It actually weighs less than a 3-ring binder (depending on how much paper you have in it). One other complaint I have is that the new Smart Covers from Apple, which are awesome, only cover the front of the iPad leaving the back to potentially get scratched. These computers are beefy! 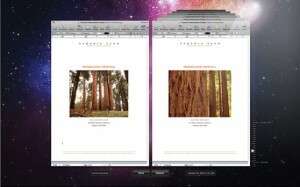 You can view the full comparison between MacBook Pros on Apple.com. After upgrading my own MacBook to its max, I have found that I don’t even use my desktop computer anymore. There was a time when I thought about purchasing a Mac Mini to account for this loss, but there’s no need when I can just plug my MacBook into my 40-inch tv and go to work. I remember when I bought my MacBook, I explicitly got the 13-inch screen because I wanted the most portable laptop you could get, but now I wish I had gotten the 17-inch so it could stay on my desk while I use a MacBook Air for my portable machine. 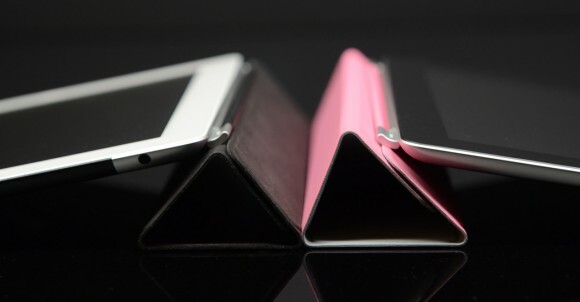 These three devices are, in some ways comparable and not in others, but that’s what makes them such a great team! They tend to complement each other with varying results and when you mix them with any smartphone (or iPhone especially), you’ll achieve the most well-rounded tech setup you can get. This is where most people get stumped. You start asking yourself, “Do I really need this?” or “Is this thing going to really benefit me?” It also doesn’t help when your friends already think you buy Apple products just to be cool! The idea behind this is simple. Like I said, I can always use my tv as a monitor, so there’s no need to upgrade to a larger MacBook at this time. I also don’t use my iPad enough to justify it sitting on my desk (although it does look really cool) and the MacBook Air would serve as my portable device where originally my iPad would fill in. I know it’s strange to think that a 13-inch MacBook isn’t considered portable anymore, but when you blog as much as I do, it becomes tedious carrying that thing around to various places. 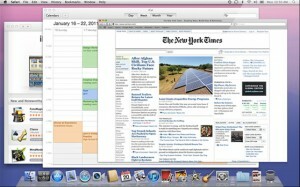 Lastly, I’m still waiting for 3G capabilities to be added to the MacBook Air! 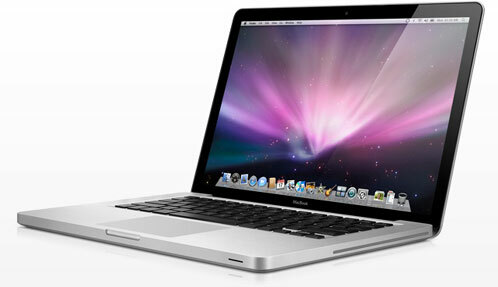 UPDATE (May 4, 2011) – There’s new competition to the MacBook Air! 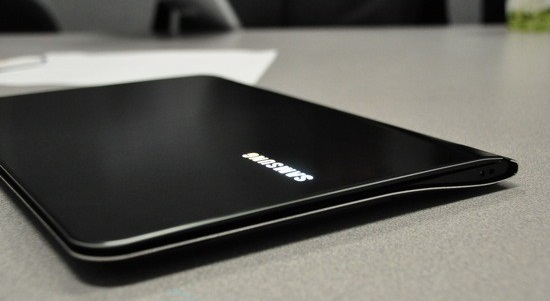 Samsung has released the Series 9 laptop that rivals the Air in almost every way. I know it’s been awhile since my last post, but I’ve been working heavily on my other site and just trying to maintain sanity throughout my life due to some unexpected changes not too long ago. At any rate, this post comes after my in-depth look at the new MacBook Air that came out less than a month ago. For all of you that feel Apple is just releasing the same old products in different packaging, understand this…you’re right. Ok so I’m an Apple fan boy and I love to see what’s next and yes, I’ve been known to drop more shiny pennies on their products than I do on more important things in life, but rather than try to explain myself, let me at least justify my purchases! Actually, I already did that when I went over the various reasons about why I own an iPhone, an MacBook and an iPad. Of course there are plenty of other devices out there that could have done almost exactly the same things (if not, more) for a LOT less, but Apple has me sucked in! So I buy an iPad because I wanted to take the mobility of the iPhone to a new level and I must tell you, I succeeded. Everything was going fine until I saw the new MacBook Air. And so it begins–the never-ending quest to have the perfect combination of technology to ensure that no matter where you’re at, you’re always connected and functional. When the first MacBook Air came out, it was “revolutionary”, it was “sleek” but most importantly, it could fit in a standard size manilla envelope. The problem with it was that it cost way too much money! In fact, I think the only good thing that came out of it was that it set a new standard for future MacBook designs. From this comparison, you can see that there is really only two models: the 11-inch screen and the 13-inch screen. Within those two models you can choose the size of your hard drive, but that’s it. Now I already own a 13-inch MacBook (2008 model–before they all went to MacBook Pros), so the only real excitement I got from these is the fact that one of them is 11-inches. The other attractive feature here is the solid-state flash memory. If you get a chance to check out one of these in the store, you’ll notice quite a difference between the boot up and running speed of a MacBook Air and a MacBook Pro. The Air will beat the Pro almost every time and it can do so with almost half the processor speed! The iPad is great, but it’s only as great as the iPhone with a slightly better advantage of having a larger screen. The reason I bought one was to go more portable than my MacBook, but to have a larger screen than my iPhone and so far the results have been…ehhh. Granted, I love using the iPad and it comes in handy when you want to write something down, check your email while in the car or even just play some games when you’re bored. The problem I keep running into is the fact that I want to use it like my MacBook, but because it doesn’t have an actual file system, I’m still stuck with the same limitations as the iPhone. So where before, I was looking for a mid-point between smartphone and laptop, it looks like now I’m looking for a mid-point between iPad and desktop computer. So far, all signs point to MacBook Air. UPDATED: Now that the iPad 2 is coming out this month (March 11, 2011), take a look at the direct comparison and find out if you think you should upgrade! After reviewing its specs, I’ve decided that aside from a slightly faster processor and the addition of two new cameras, it’s practically the same as the first iPad. As I mentioned, I don’t officially have a MacBook Pro because my model came out with there was still just MacBooks, but since my system specs are the same as the new Pros (albeit no SD card reader), I can speak on this. My original setup consisted of a desktop PC and an HP laptop. I sold the HP and got the MacBook for two reasons: new computer and to become more portable. That’s why I chose the 13-inch model. 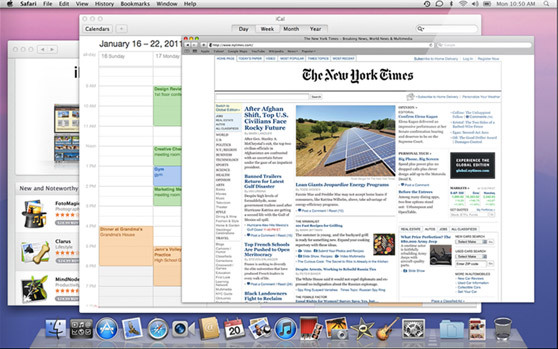 As time went on, I noticed I was using the MacBook more and more and the desktop less and less. The problem with this was that the laptop became my desktop replacement, but now I was stuck with a 13-in screen! While each of these devices serves different purposes and not everyone will find the same use in them, my opinion is that owning a MacBook Pro and an iPad or a MacBook Air and an iPad are great additions to the smartphone you probably already own. Each of them allows you to be portable in different ways and depending on the situation, you will find that they complement your life very well. Now, if you own all three, you just have nothing better to spend your money on! Now if only Apple would put some built-in 3G capabilities on the MacBook Air–or any MacBook for that matter, then we’d be sittin’ pretty!